Ken Shiro lands a right hand on Milan Melindo. 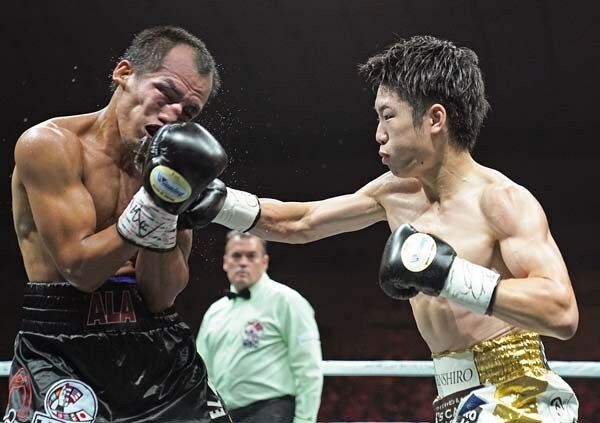 WBC junior flyweight champion Ken Shiro 14-0 (8) retained his world championship with an impressive seventh round TKO of former IBF boss Milan Melindo 37-4 (13) at the Yokohama Arena in Yokohama, Japan on Sunday. Japan’s 26-year-old ‘Amazing Boy’ controlled the early action with his educated jab and quick footwork, but Melindo landed a hard right cross to take the second frame. Shiro regained control in the third and ramped up his attack in by the fifth. In the sixth round Shiro bloodied the left eye of the 30-year-old Filipino ex-champ, opening up in the following round to force referee Laurence Cole to stop the fight on cuts under the recommendation of the ringside physician. The official time of the stoppage was 2:47 of round number seven. It was the first time Melindo had been stopped in 41 professional contests. Shiro, who was making the fourth defence of the world title he won from Ganigan Lopez in May of last year, scored his third stoppage victory in a row. “I wish to stay in this class and aim to reach and break Mr. Yoko Gushiken’s record of thirteen defences,” said Shiro in comments published by Fightnews. The fight took place on the undercard of Naoya Inoue versus Juan Carlos Payano in the quarterfinals of season two of the World Boxing Super Series [WBSS]. “Should the WBSS expand its tournaments to the 108-pound division, I’m very much willing to participate in it,” said Shiro, who was leading 59-55 on all three judges’ scorecards. Melindo expressed his disappointed in the result but praised Shiro for his performance.